Other way of browsing our social networking sites is through an app called Opera Mini. It is a web browser designed primarily for mobile phones and smartphones. Some of the devices have pre-installed of Opera Mini and others have not. You can also downloaded it if your device is Android, iOS, Symbian OS, bada, or Windows Mobile. I'm sure you are wondering why I'm discussing Opera Mini. Anyway Smart will be having a promo that is connected with the Opera Mini. 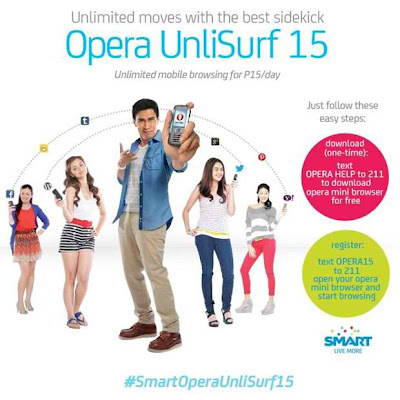 Local telecom, Smart recently announced their newest promo called Opera UnliSurf15. It said to be the most affordable unlimited surfing mobile. With this new promo, everyone will definitely enjoy checking and updating each social networking sites. The UnliSurf15 promo is unlimited for one day only while the Opera Unlisurf60 is unlimited for 5 days. Along with the promo is 15MB wherein you can download some files, games, apps and others for that threshold only. To register on these promos using your phone, just type “OPERA 15” or “OPERA 60” and send it to 211. Is that easy. Right? These promos are available for all Smart, Talk ‘N Text (Prepaid and Postpaid), and Infinity subscribers. I’m hoping all the telecoms in the Philippines will provide cheaper plans for its subscribers when it comes to data plans. They can also offer a lot of good promos that can help to maximize the potential of our mobile phones.